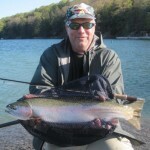 Upstate Guide Service.com is the web site of licensed professional guide Mike Crawford. Relying on 30 years of experience, he provides fully outfitted and guided fishing fly fishing, light tackle, ice fishing, and water fowling trips on the waters of the Eastern Finger Lake, Central New York, and North Country regions of Upstate New York. The spring of 2016 marks Upstate Guide Service’s 13th season of providing successful adventures. Every trip is tailored to each guest. Your own expectations define your adventure. Each trip is outfitted, all the equipment you need is provided. A knowledge of when and where, combined with dependable equipment and effective techniques, insures you make the most of your valuable vacation time. While the main focus of each trip is success in catching fish or bagging birds…Creating a safe, comfortable, and enjoyable experience is most important. A good day spent on the water fishing or hunting provides a simple satisfaction that etches lasting memories in our minds. Memories that bring smiles to our faces long after the day is over. That’s what it’s all about.